On many of my trips to Marrakesh I’ve sat on a roof terrace enjoying mint team, gazing at the Atlas mountains and hoping I’d have a chance to visit them soon. When I discovered Kasbah du Toubkal, a sustainable lodge, located at the foot of Jebel Toubkal, North Africa’s highest peak, I knew this was my opportunity! We flew into Marrakesh Menara Airport on a 3 hour 30 minute direct flight from London; its incredible can we can fly to another continent in such a short time! Kasbah du Toubkal organised our airport transfer, which consisted of approximately 1 hour car ride up winding mountain roads, to the local Berber village of Imlil. This is the furthest we could go by car and so we were met by a donkey and he’s owner who took our luggage and led us up some further winding treks. As Kasbah du toubkal isn’t accessible my car, a donkey or hiking is the only way to reach it - we loved this as it felt like the start of a real adventure! The whole journey can take over 2 hours, so factor this into the flight you book, as you’ll be hiking in pitch darkness if you land quite late in Marrakesh. Although this isn’t a problem for all and it’ll give you the chance to gaze upon the beautiful night sky full of stars. 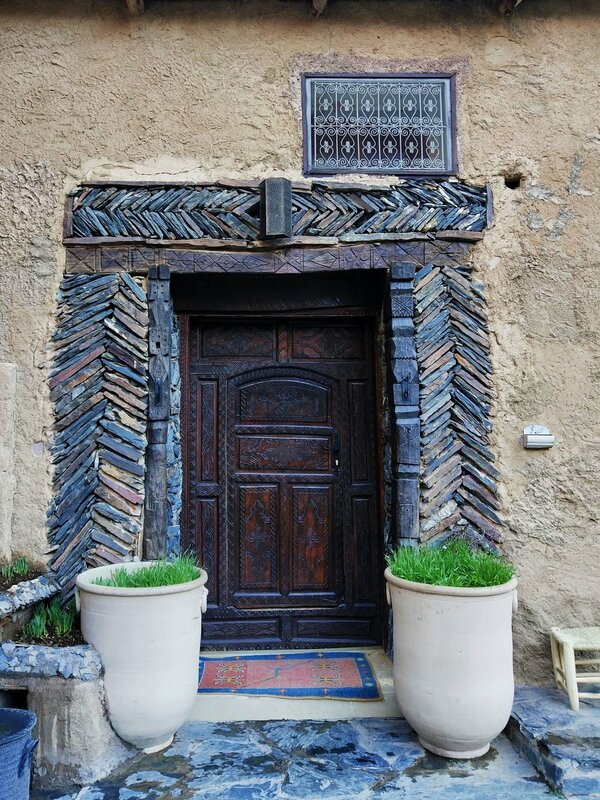 Kasbah du Toubkal doesn’t refer to itself as a hotel, instead it is a Berber centre of hospitality and as an eco-lodge. Instead of providing a standard, hotel-stay experience, Kasbah du Toubkal offers so much more by focusing on the merits of Berber hospitality. 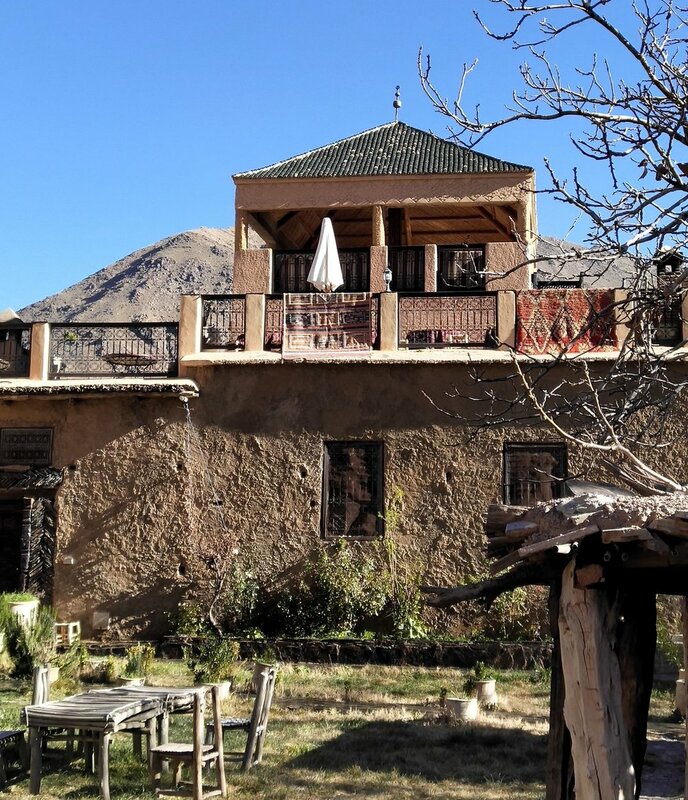 What’s more Kasbah du Toubkal has a ‘sustainability-first’ approach, meaning you can rest assured that all their outputs bring benefit to the environment and wider community too. After a friendly and traditional welcome at reception, with rose water to clean our hands and face and mint tea and dates to graze on, we checked into our room. We stayed in a Standard Room and it was more than perfect for our stay. The room was equipped with an ensuite shower and bath, carved walnut furniture and tea and coffee making facilities, as well as extra heating for the cold winter nights. Note that there is no wifi in the rooms and guest have to go to the main building to connect to wifi. This wasn’t a problem for us as we very quickly got used to it, and actually enjoyed, not having access to wifi all throughout our stay and in the rooms! In front of our room we had a lovely large balcony with a gorgeous seating area, chess board and deck chairs too! The room faced the impressive Atlas Mountain peaks, which meant that we could spend the mornings relaxing outside on our deck chairs watching the sun rise up behind the peaks - so idyllic! The building itself used to be the summer home of a Caid, a Moroccan local chief, before it was bought and completely refurbished by current owners. Today the building is a beautiful space, with a stone tower, terraces and a gorgeous green courtyard in the middle. Kasbah du Toubkal offer full board accommodation, which is what we opted for. Breakfast, and dinner is served in the main dining room located in the main building. Each occasion has a different feel to it so it doesn’t seem that you are dining in the same place each time. Breakfast is mainly a buffet, with hot dishes served to the table. These include eggs, bread and moroccan breakfast specialities, such as msemen (flat, square-shaped Moroccan pancakes) and home-made khobz (a traditional Moroccan bread which is shaped like a round, flat loaf). Lunch is a relaxing affair and served on the restaurant rooftop balcony, with stunning views across the hotel, mountains, waterfall and 360 degree views of the breathtaking landscape. For lunch we tried a variety of dishes over the 3 days we were there for, including chicken tagine, beef kebabs, lamb couscous and more. Lunch is a three course affair and the starter is usually a delicious salad and there is normally fruit for dessert. Tea, coffee and soft drinks are included in the board and can be ordered at anytime during the stay. We made the most of this and normally enjoyed a mint tea on the rooftop, in the sunshine after our appetising lunch. Dinner at Kasbah du Toubkal is the most lavish meal. The main dining room is adorned by candle light and a roaring fire in the corner, giving it a cosy, romantic feel. Dinner is also made up of three courses, with bread and appetisers to start, usually followed by a tagine, couscous, or rice dish. For dessert we were able to try cake, apple tart and creme brule over a couple of days. Dinner can be ended with tea or coffee and although Kasbah du Toubkal don’t offer alcohol, you can bring your own and enjoy with the meal. It’s worth noting that there is no menu at Kasbah du Toubkal so you can’t choose what you eat. However the kitchen do cater for dietary requirements and preference so make sure you tell them in advance. 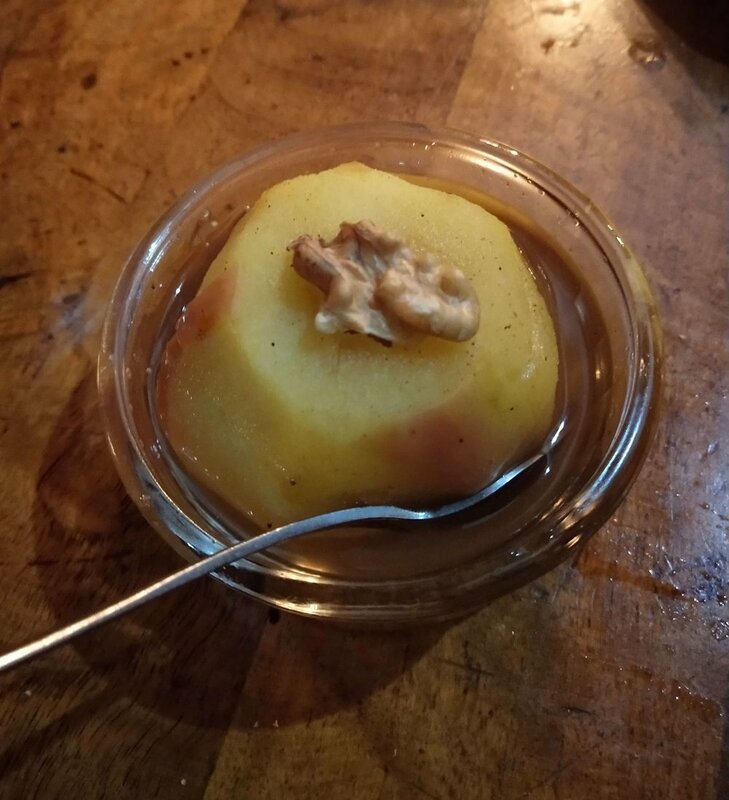 We really enjoyed all the food we tried at Kasbah du Toubkal, and it was evident from the flavour that each dish was freshly cooked with locally sourced ingredients. We had the chance to visit the chefs in the kitchen and get involved with creating a few dishes, and we were very impressed with the quality of the equipment and scale of work they could do. 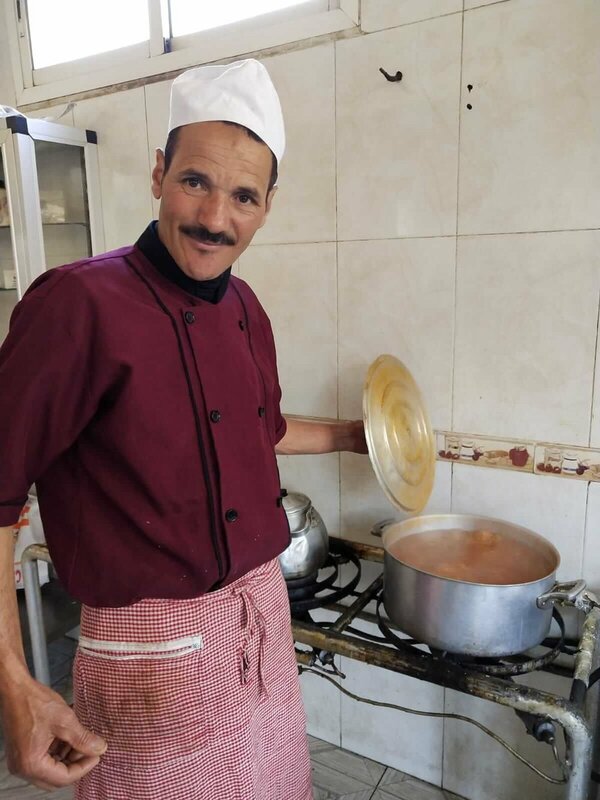 Kasbah du Toubkal often hosts lunches and dinners for large groups passing through the area and the kitchen and staff are fully equipped to make each meal a grand occasion, no matter the number of diners. The primary activity and one of the key reasons people visit Kasbah du toubkal is for the hiking. There are a variety of day trips, to different parts of the Atlas Mountains which can last from half a day up to a week. Trekking in the area also allows you to meet locals and develop an deeper understanding of the local Berber culture and especially the village of Imlil. We opted for a half day hike in the area, during which our guide took us through a variety of scenery including waterfalls, villages, grassland and even past the local watermill. We really enjoyed our hike as it wasn’t too strenuous, yet it took us all the way around Kasbah du Toubkal, giving us good context of where we were staying. For those who want a more relaxing break like us, there are other amenities located with the hotel. There is a on site hammam with a clay domed roof which can be booked in half hour slots and used throughout the stay. The hammam includes a naturally heated steam room, hot plunge pool, showers and changing facilities. Note that this is a traditional Berber-style hammam so the steam room doesn’t get as hot is standard in the western style. Our stay as Kasbah du Toubkal is a genuinely memorable experience, especially because the whole place is so unique! Everything from the intensely starry sky, super friendly cats and delicious home-cooked food will take your breathaway. Kasbah du Toubkal is the ideal base for exploring the Atlas mountains, although we used it as a mountain retreat and came away feeling uttering relaxed and revived at the end of it. Their sustainable approach has also paid off, as everywhere you go in Imlil you can see the benefits Kasbah has brought to the village, from small things such as newly paved roads to ensuring a living wage and pushing for education for women. 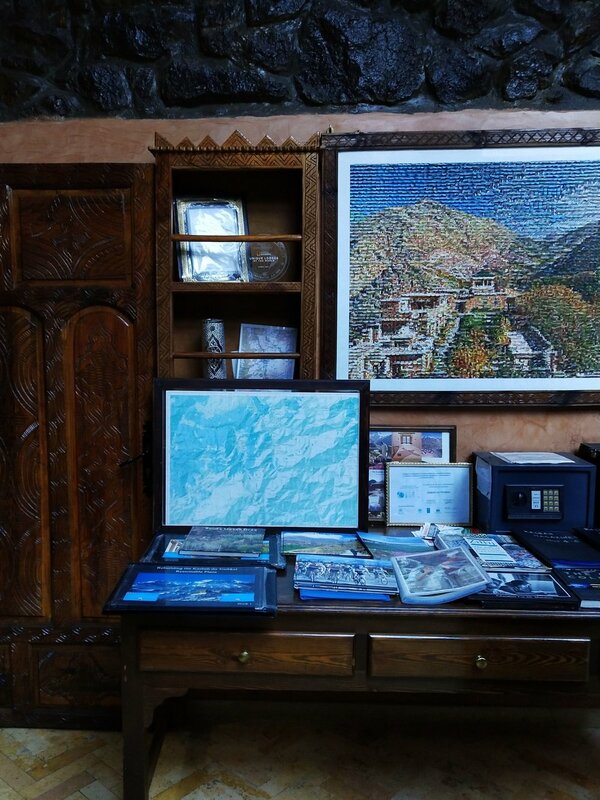 As a result Kasbah du Toubkal has won an array of awards and is also a founding member of National Geographic Unique Lodges of the World. I would recommend that everyone stay somewhere as beautiful, unique and sustainable as Kasbah du Toubkal! Find out more about Kasbah du Toubkal and book your stay! I had an amazing time as this beautiful hotel - have you ever stayed anywhere as unique as the Kasbah du Toubkal? Let me know in the comments below! Special thanks to Kasbah du Toubkal for their hospitality!